SHOREHAM Football Club boss Kane Louis was left frustrated as his side’s County League Division 1 game against Chichester City was postponed on Tuesday. The game was called off when a water pipe burst at Middle Road a couple of hours before kick-off. Louis was disappointed as the pitch had held up well despite snow earlier in the day and was deemed playable. He said: “It was really disappointing that the game was called off. “A lot of games had been called off owing to snow and poor weather conditions. Shoreham had recorded their most impressive victory of the season when they overcame Eastbourne Town 2-0 on Saturday. 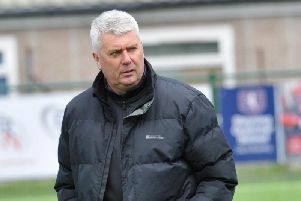 Louis said: “All of the squad were looking forward to the game against Chichester. “It was our best display of the season on Saturday and it would have been good to get back into action so soon after that win.